Strawberries have always been a favorite with kids. Most kids love them so much they actually don't realize they are good for you. They are packed full of Vitamin C and potassium. Strawberries are not only bite size treats, you can make a lot of fun recipes with them. Here are a few of our favorite easy kid recipes that are kid inspired and simple enough for even young kids to create. This makes a great kid snack that kids can make themselves. 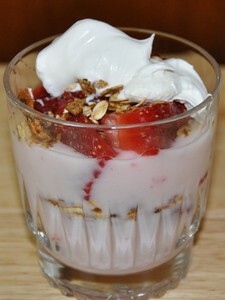 In a fun glass or clear plastic cup, add 2-3 Tablespoons strawberry or vanilla flavored yogurt to the bottom. 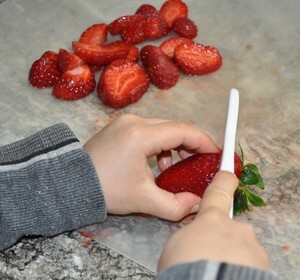 Have kids use a table knife and cut 2-3 strawberries in bite size pieces. Next sprinkle 2-3 Tablespoons crushed granola, dry cereal or chopped nuts, whichever is their favorite. Layer again yogurt, strawberries and nuts. Top with a spoonful of whipped topping. Serve immediately or store in the refrigerator until ready to eat. The idea of this fun salad is to chop your fruit in very small pieces. You can change the fruit as you would like just use soft fruits that will be easy for kids to cut. You could serve this on mini tortilla chips like a fruit salsa. Or serve your mini salad inside small pie shells or mini tart shells for fun. Using a cheese grater, shred 1 clean green apple into a serving bowl. Finely chop 5-10 strawberries and add with the apple. Open 1 can mandarin oranges or peel 2 fresh tangerines. Cut each orange slice in 2-3 pieces and add to bowl. Cut 1 banana in slices then cut each slice in four quarters. Drizzle 1 tablespoon lemon juice over your fruit to keep your bananas and apples from turning brown. Toss your small chopped fruit together and serve immediately. This recipe makes a yummy strawberry dessert kids can easily melt in the microwave. Place one large plain chocolate candy bar in a microwave safe dish. Microwave for 15-30 seconds and stir well. If not completely melted, microwave 15 seconds longer. Stir in chopped nuts, if desired. Wash strawberries and cut off tops. Poke a strawberry on a fork and dip in chocolate. Eat and enjoy! Gather some friends together and have kids cooking party with strawberries as your theme. When strawberries are in season this makes a great family and friends activity. You can make strawberry shortcakes or crepes with chopped strawberries and chocolate or strawberry syrup. For a refreshing drink serve strawberry smoothies. In our house just a bowl of fresh strawberries is considered a yummy treat. Strawberries are a great way to get kids involved in the kitchen. They can easily use a non sharp knife to cut off the tops or cut a strawberry in slices. Let your kids experiment and create their own unique strawberry recipes for kids.